…Firm resolve has given way to disappointing frailty, as the shape and direction of US foreign policy increasingly resembles something taken straight out of Bill Clinton’s playbook. Across the board, on nearly every major issue of the day, from Iran to Syria to North Korea, the Bush administration is in retreat, abandoning the principled stands of yesteryear and replacing them with the unscrupulous and inexplicable policies now being pursued by the Department of State. Take, for example, the donor conference held in Paris this week, where the nations of the world unashamedly gathered to prop up the corrupt, incompetent and ineffectual Palestinian regime headed by Mahmoud Abbas. Leading the charge, the US pledged more than $550 million in aid to the Palestinians in 2008. But while American diplomats were busy filling out checks to Abbas, Palestinian terrorists in Gaza continued to target Israeli civilians. On Sunday, they fired a rocket which struck an Israeli home in Kibbutz Zikim and wounded a 2-year old child. Needless to say, neither the toddler nor his parents will be receiving any Western assistance. THEN THERE is North Korea. On December 1, Bush took the unusual step of sending a personal letter to Pyongyang’s thug-in-chief Kim Jong Il, essentially pleading with him to tell the truth and to disclose all of his country’s nuclear programs by the end of the year. In exchange, the archaic Stalinist regime can expect to receive American recognition and, of course, large infusions of aid. He is putting his faith in Kim Jong-Il’s promises, just as Clinton did when he signed a similar deal with Pyongyang in October 1994 which later proved worthless. And what of the regimes in Iran and Syria, which have aided and abetted insurgents in Iraq in their efforts to kill American servicemen? In both instances, the Bush administration has adopted a policy of diplomacy and talk, rather than action. Indeed, Damascus was even invited to take part in the Annapolis conference, granting further legitimacy to Syrian President Bashar Assad and his repressive regime. 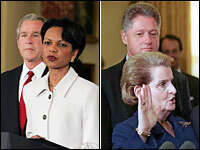 The result has effectively been a quiet coup, as George W. Clinton replaces Bush. And that spells trouble, big trouble, in the War on Terror - not only for Israel, but for America too. The article could have added the quashing of several Justice Department investigations of the Clintons. Indeed, Bush has given up on doing the right thing, and cut out early. If anyone wants to know what a Hillary presidency would be like, we’ve had a taste of it for the past year of this administration. In Bush’s first term, before his body became possessed, he tried shunning the Palestinians, even pulling a Giuliani by not allowing Arafat near the White House for as long as the man continued to tacitly support terrorism — which ended up killing the man in 2004. Bush basically killed Arafat by telling the Palestinians, “When you stop being terrorists, then we can talk.” For this, Bush was criticized — including by dumb liberal Jews — for “disengaging”. Under pressure to “do something,” but seeing that Palestinians have no plans to stop being terrorists anytime soon, a leader is left with only one, usual plan of action, or “engagement”: feed more Jews to the Arabs. Just so long as you’re engaged. Ah yes. When your administration is about to expire, and doing the right thing didn’t get done, you put the screws to Israel. That is, you screw the Jew. After all, you’re not going to make terrorists do something, so you have to put pressure on the side that you can force to do something. [H]ow confident of Bush Senior’s cooperation must Clinton be to roll this idea out publicly, while Bush Junior is still in the White House? The whole point of the tour in question would be to reassure the world that America is “open for business and cooperation again” after a disastrous two-term President. A two-term President named Bush. And that Bush — hard to believe this needs pointing out — would be the son of the “Former President” Clinton is so quick to include in his new diplomatic brief. A very strange assumption to make, and to publicize on the stump. But what’s really notable about the quote, and this entire line of thinking, is what it reveals about Clinton’s general overall perceptions of his friendship with Bush Sr.
Clearly he views it as politically advantageous; clearly he sees no problem campaigning on it, capitalizing on it when the chips are down. Bill Clinton has known for at least the last handful of years, conservatively speaking, that his wife would be running for President in 2008, or 2012 if circumstances dictated. He’s known all along that her largest hurdle would be making a case to the 50% of Americans who consistently tell pollsters that they would prefer gall bladder surgery to voting for Hillary Clinton. Consider his now famously fabulous relationship with George Herbert Walker Bush in this context: outreach to moderate Republicans. Sure, Bill Clinton has always gravitated to father figures; sure, he’s always made outreach to the other side of the aisle the measure of his personal charisma. But ex-Presidents…are extraordinarily savvy about where and when they risk their accumulated good will with the American people. Where they have their picture taken, to put it another way. Now consider the veritable river of images that has been allowed to flow over the last five or six years, images of Bill and Poppy Bush….How many pictures have you seen of Bill and Jimmy Carter since Clinton left the White House? But wait, you say, with W’s poll numbers so depressed, wouldn’t Clinton risk a lot by being seen with a Bush, any Bush? Not at all. Think about how the relationship is usually portrayed by the media: as a thorn in W’s side, somehow a repudiation of a son who’s strayed from the father’s will. Does [Vermont Daily Briefing] think the entire friendship is staged? Not at all. Clinton has always needed validation from the other side of the aisle even more than from his own, and palling around with a Republican old enough to be his father is psychologically spot on. But with Hillary’s election looming only a handful of years away, do you really believe the friendship would have been allowed to flower so very, very publicly if it didn’t actually help, in some way, shape or form? And given that successive Presidencies have overlapping needs — like delimiting access to Presidential papers, to take just one example — that friendship could be more useful going forward. [The former President] wholeheartedly supports the President of the United States, including his foreign policy. He has never discussed an ‘around-the-world-mission’ with either former President Bill Clinton or Senator Clinton, nor does he think such a mission is warranted since he is proud of the role America continues to play around the world as the beacon of hope for freedom and democracy. The elder Bush shouldn’t be taken aback by Clinton’s statement, of course, since it’s the sort of thing that can easily happen when someone is used to you letting him defecate on your family. I recently learned that former Bush (Sr.) speechwriter Chriss Winston has written a book along with conservative commentator Myrna Blyth. It’s called How to Raise An American: 1776 Tools, Tips & Activities to Help Your Child Love this Country. Please, please Myrna Blyth, forget about raising US patriots and focus on raising world citizens. consider this book to be a fine example of what is wrong with our beloved, beleaguered country. As an aside, the suggestion to think as a “world citizen” always cracks me up. On a fairly recent episode of “Real Time with Bill Maher”, Janeane Garofolo said she thought more like a “citizen of the world” than “an American”. There she was, tatoos all up her arms, which you could see because she was wearing a tank top. Had I been on that panel, I’d have told her that if she’s a citizen of the world, then she shouldn’t mind — and there shouldn’t be any legal repercussions — if after the show I stoned her to death for wearing what she was wearing on national TV. Which no male relative gave her permission to be on in the first place. In the last season of Donald Trump’s “The Apprentice”, one of the assigned tasks was to create a multi-media advertising campaign for Trump’s residential towers in Las Vegas. What got one person fired was printing the wrong sales office phone number on the brochure. Between Hillary Clinton’s reference this week to Benazir Bhutto’s “two children” and the “assassination” of Bhutto’s father (there are three kids, and Bhutto’s father was executed) — and the recent campaign cards telling Iowans to caucus on Jan. 14th instead of Jan. 3rd — we know that Hillary Clinton doesn’t have what it takes to become the Apprentice, much less the President. Australian Taliban fighter David Hicks has been released after being imprisoned for six years. A U.S.-imposed sentence of only nine months was tacked on to time served without charges at Guantanamo Bay, after Hicks finally pled guilty in a plea bargain earlier this year. One day in 1998, he telephoned his parents to tell them he’d decided to join an organisation called the KLA. “I thought it was an airline,” [father] Terry Hicks says. It wasn’t - it was the Kosovo Liberation Army, then fighting against the Serbs in the Balkans. Hicks travelled via Adelaide to Kosovo, where he fought alongside ethnic Albanian Muslims in the KLA. Hicks travelled to Pakistan in late 1999 to further his Islamic studies. Somehow, he ended up training with terrorist groups Lashkar-e-Toiba and al-Qaida. Somehow?! Somehow?! As if there’s no connection or progression from the Kosovo jihad to the rest of it? Let this be a lesson to terror recruits everywhere: if you want to kill Americans, Europeans, Thai, Africans, Indians and others — but don’t want a heavy sentence in case you get caught — make sure to also kill some Serbs. Your next opportunity is just around the New Year’s corner. David Hicks is free to go back to Kosovo too, this time as our ally. The hapless hijackers who stole a loaded FedEx truck and kidnapped its driver — only to abandon both after they were unable to get at the locked-up loot — told their captive stories about their supposed lives in Albania and stopped for pizza during an odd five-hour odyssey, the driver said. Forced to ride face-down and handcuffed in a sport utility vehicle with a gun to the back of his head, “I kept saying to myself, ‘If they’re going to kill me, I hope it’s fast and doesn’t hurt,” Robert McGarry said….Police said Sunday no arrests had been made in the case. Two forced him into the SUV while a third drove off in his delivery truck. McGarry’s captors drove him through the city, one threatening him while the other struck a more congenial, calming tone, he said. The 18-wheeler was laden with holiday shipments, but the thieves weren’t able to get at them. They let the driver go at about 1:30 a.m. Friday in the Williamsburg neighborhood. He said the robbers gave him $60 so he could get back to Manhattan; instead, he quickly waved down a police car. The truck was found abandoned, its contents still locked in metal air freight containers, at about 5:30 a.m. in nearby Greenpoint, police said. they stop at a relative’s pizza joint along the way. while they have a gun to your head, they say pro-American things. the plan doesn’t go as planned. they started the robbery with more money than they have at the end. Sen. Hillary Rodham Clinton, D-N.Y., is calling for a formal government investigation into allegations that a young female American contractor was gang-raped in Iraq and then held incommunicado in a large shipping container by her American employer, KBR, then a subsidiary of Halliburton. “These claims must be taken seriously and the U.S. government must act immediately to investigate Ms. Jones’ claims,” Sen. Clinton wrote in a letter…to Secretary of State Condoleezza Rice, Secretary of Defense Robert Gates and Attorney General Michael Mukasey. “Never before has a prime minister or president of Kosovo been invited to enter the Security Council room. Never has anyone been called who does not represent a sovereign country, a UN member state or a UN mission – that has never happened. It might not be pleasant for Serbia, but its position has been eroded,” Svilanovic said. A more grave implication is for the UN itself, a forum for sovereign states, not separatists like Kosovo Albanians whose demands violate the very charter, or reason for UNs existence. This is like allowing Satan to tell God how he should organize heaven. Why is Serbia accused of UN Resolution violation? US and many Muslim states have long been claiming that Serbia has “lost its right” over Kosovo and now they are in a hot pursuit of a scheme to legalize that claim. To this end, NATO is accusing Serbia of violating the UN Resolution 1244 because it opened up an office in Kosovska Mitrovica. “This is a violation of 1244,” UNMIK chief Joachim Ruecker bluntly stated while his spokesman Alexander Ivanko reiterated the same in a press statement. Resolution 1244 is the major thorn in the eye of Kosovo’s Muslim separatists because it defines Kosovo as the sovereign territory of Serbia. By accusing Serbia of violating the Resolution, NATO countries are seeking a pretext to toss the Resolution out and denounce the sovereignty stipulation as null and void and with that, remove Serbia from the legal deed of sovereignty over Kosovo. There is something predictable about Christmas time – Fairy lights in the high street, seasonal music in the shops, and the arrival of a small envelope in your letter box, asking for a donation, often to Christian based charities such as War on Want and Christian Aid. Sadly, this appeal for festive generosity is intrinsically linked to a more recent Christmas trend – the blanket condemnation and demonization of Israel. You can be sure that Palestinians will reward this kind of solidarity in Bethlehem as they’ve done before: by peeing and pooping in the church pews and on the church walls, using the Bible as toilet paper and smashing statues. Keep it up, War on Want, et al! Not surprisingly, at the time of this particular episode in 2002, one of the priests blamed Israel for the standoff. I’ve written more than a few articles and items titled “Dumb Jews”, but there are apparently a lot of Christians who are so dumb as to not be definable as Christian anymore, given that the Bible says to not foresake Israel, much less concoct lies to be able to do just that. The mail-in candidate cards being passed out last week at a Hillary Clinton rally in Iowa encouraged voters to go caucus on Jan. 14, eleven days too late for the January 3rd Iowa caucus. What’s so wrong with that? Why is everyone jumping all over her? It’s her first constructive idea. It finally gives me something I can agree with her on. Remember, Iowa voters: January 14th! I do, however, offer my condolences to the family of whoever made the mistake. That is just unique to that particular store or Market. I know the store in my town has the overnight crew on Christmas night take all decorations down and move all Christmas items to a specofic place in the store so the bargain hunters coming in on the 26th know right where to find them. This sounds like a case of an overzealous Store Manager jumping the gun. A letter sent to his Market Manager would fix that quick. I read your post about the Wal-Mart store that had all its Christmas decorations down way early. My husband works at one of the Wal-Marts in Anchorage and according to him, decorations were up when the store closed at 6PM Christmas Eve. He believes Christmas is the only day where no one is in a Wal-Mart store. Though they do close for Thanksgiving, management and others work that day to set the stores up for Black Friday. On Christmas, the stores are empty. If that helps any. You are currently browsing the Republican Riot weblog archives for December, 2007.